Neil Young News: Neil Young on "SEPARATION OF CORPORATION AND STATE"
Neil Young on "SEPARATION OF CORPORATION AND STATE"
So what's on Neil's mind lately? "Under the guise of democracy, huge global corporations have purchased our politicians and are writing laws that poison our planet and dismantle our democratic process. Corporations have usurped democracy by using their vast wealth to influence politics and silence the citizen voice in government. All natural living systems are in rapid decline, pushing the human race ever closer to extinction. Despite enacted environmental protections, global corporations have recklessly abused the four natural resources that we rely on for life (air, soil, fresh water and oceans) as an open sewer for their toxic wastes with blatant disregard for humankind. Neither the environmental crisis nor the many other social and economic crises we face can be addressed until democracy is restored and this cycle of corruption is broken by corporate money being removed from politics. 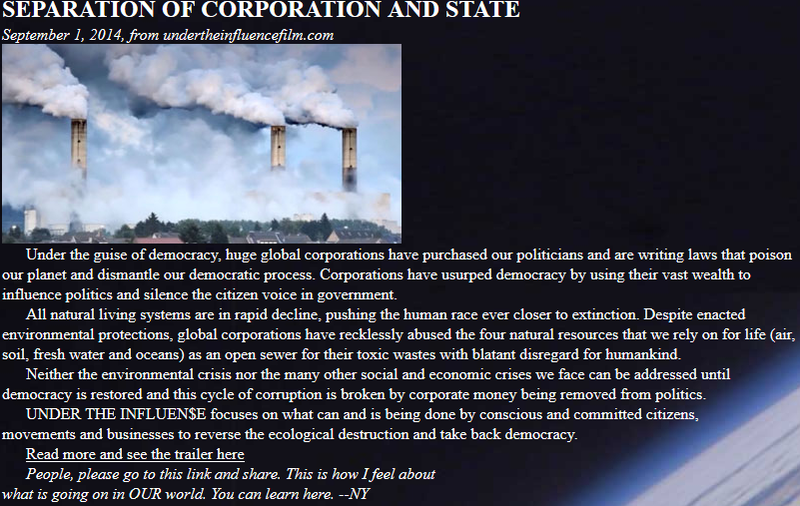 UNDER THE INFLUEN$E focuses on what can and is being done by conscious and committed citizens, movements and businesses to reverse the ecological destruction and take back democracy." People, please go to this link and share. SNEAK PREVIEW... from UNDERtheINFLUENCE on Vimeo. Second song I ever wrote and actually the first that had something to say that reflected my thoughts and feelings in my heart about my life and our shared experience in our times. Got some of the flavor of this post in it. Have we made any progress? Nestle is a an aberration of the food service industry. Nestle, and its many brands are changing the way we think about water today. Without any regard for the world around them, Nestle buys ground water for less than a penny a gallon and sells it to anyone who can pay about a dollar a pint. Back in the 1980's in the United States, the bottled mineral water Perrier was fast becoming a status symbol for the youth and the middle to upper classes. Companies like Nestle and others took notice of Perriers incredible success selling bottled water in the lucrative U.S. market. Perrier, as well as much of the bottled water industry, suffered a terrible blow when in 1990 a group in North Carolina found the Petrochemical Benzene in a number of samples of Perrier bottled water. The American Petroleum Institute once stated "It is generally considered that the only safe level of concentration for benzene is absolute zero." People started contracting forms of Leukemia, and some suffered bone marrow failure as a result of benzene exposure. The public became afraid of drinking bottled water for a some time, because, of the fear of contamination. Nestle does not consider humanitarian issues and they do not follow through on their humanitarian promises. It is a pure profit model. Nestles prerogative is to gather and bottle as much ground water as they legally can and its still available. If no Authority is present to charge for the water they pump it into trucks as fast as they can. They bottle it and sell it back to the people for a price. They dont even have to filter it much, ground water is already very clean. Nestle is in the groundwater business. Scientists say continental plate, on which much Southern California rests, has risen about an inch as a consequence of groundwater loss. The plate as a whole is actually lighter than was, a few years ago. GPS studies have found that around 62 trillion gallons of ground water have disapeared in the last few years due in a large part to the pumping of underground watersheds and aquifers. The loss of groundwater worldwide will first and foremost affect agriculture, and undeveloped areas. The water tables will drop and more and more wells will become useless without re-drilling them deeper into the earth. Agriculture will no longer be able to depend on groundwater. More water will have to be containerized and transported to outlying areas putting many more trucks on the road. Food will become exceedingly expensive because agriculture must now filter nasty river water. In Maine there was a giant watershed so full they named it old trusty, Nestle bottled all of it. Left to their own devices, the Nestle corporation under their CEO Paul Bulcke's authority will continue to have a devastating effect worldwide. Nestle wanted 82 million gallons a year out of a river near Mt. Shasta. Attorney General of California Jerry Brown threatened to sue Nestle for economical impact reports that they didn't want to provide. What Nestle did want to reveal is that the river was a major tributary of a key reserviior in California's infrastructure. Nestle has been denied the right to pump ground water by groups of concerned citizens in the United States. The EPA, could follow suit on a national scale and bury Nestle in litigation considering its holdings in the U.S.
Why not make them do economic impact reports for all their pumping throughout the United States and freeze any new pumps until they finish them all. Nestle will only rethink its water industry under stern governmental authority and community involvement. Thank You for Supporting Thrasher's Wheat!